Dry body brushing allows new skin cells to form, shedding the old ones. It provides better circulation and lymphatic drainage, leading to healthier looking skin. It also releases toxins which helps the nervous system. It helps to remove cellulite and gets rid of clogged pores. Start at your feet, and use upward strokes. Do this a few times as your move upwards. You will next move to your arms, and to your chest and neck last. Avoid the face, for the skin is too sensitive for the brush. Do this twice a day. Manual Lymphatic Treatment (MLT) and massage therapy are two very different manual treatment modalities. The only similarity is that both have techniques that require the therapist to put their hands on the client’s skin. The word “massage” originates from the Greek word “massain” which means to knead. This describes techniques such as effleurage, long gliding strokes, and petrissage, kneading strokes. Pressure is also applied to reach underlying muscle tissues. The pressure used when giving a MLT session is of much lower intensity. The intent is to effect lymphatic structures located in the subcutaneous tissues. To do this, strokes are used to stretch the skin and then a directional stroke to send lymphatic fluid towards the regional lymph nodes. This technique should be sufficient enough to stretch the subcutaneous tissue against the fascia but not manipulate the muscle tissue in that area. The amount of pressure needed could be compared to the pressure you would use to stroke a newborn’s head. The purpose for MLT is to increase the rate at which the lymphatic system pumps. The accelerated drainage promotes pain control and the light pressure is soothing and sedative. In a case of Lymphedema, the lymph is rerouted around blocked areas to centrally located healthy vessels to relieve chronic swelling. This increase of drainage is also beneficial for detoxification. The lymph nodes produce lymphocytes which are white blood cells. Their job is to attack foreign invaders. The antibodies produced travel through the body by way of lymph fluid to assist the immune system. Both MLT and massage therapy are beneficial treatments. Discuss with your massage therapist which treatment will bring the desired results you need. 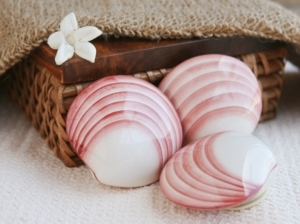 Lava Shell massages are a type of heat treatment massage that uses Tiger-striped clam shells as a massage tool. The Tiger-striped clams are native to the Philippines and are very smooth to the touch. These shells will give a unique feeling and enhance the experience. The shells are filled with heat packs and activator fluids to create heat to enhance the effectiveness of the massage. A lava shell massage has many benefits that cannot be ignored. Let us take a closer look at some of the health and mental benefits that you could experience. The massage, plus the warmth from the lava shells, will stimulate lymph activity and help your natural ability to flush toxins out of your body. The warmth of the shell and the massage techniques from the therapist will increase the blood flow in your body. This is important in the healing process if you have an injury or muscle pain, due to the increase of blood and oxygen to the injured area to promote faster healing. The heat from the shells, combined with the massage techniques of the therapist, could also help with the suffering from painful arthritic joint pain. This type of hot massage leaves you with healthier and younger looking skin because it helps stimulate the body’s production of new and strong skin cells. One of the main benefits that keeps people coming back to this technique is the total feeling of ease that rolls over you. It often makes you enter a deep state of relaxation, due to the skilled technique of the massage therapist and heat working deep into your muscles. The lava shell massage is actually more hygienic and natural when compared to other methods that are commonly used for massages. The primary reason for this is due to the shells not being able to absorb any oil or bacteria from the person receiving or giving the massage. We are pleased to welcome our newest team member, Justin M.! Justin graduated from the Baltimore School of Massage, and has worked as a sports massage therapist for football teams, as well as at Hershey Entertainment and Resorts. massage she has ever had. Since Justin has joined our team, The Spa at Willow Pond will soon be offering medical massages, which will be an hour long for $80. Medical massages are wonderful for those who have tendinitis or lower back pain. If you do not want to drive to the Hershey Spa for a medical massage, Justin can help you here at The Spa at Willow Pond! Ear Candling is a practice that has been performed since the ancient Romans. The practice incorporates a hollow, wax covered cloth candle that is placed in the ear, lit, and then covered so that no smoke escapes. The practice improves ones hearing as well as their balance, for the outer, middle, and inner ear canals are responsible for such tasks, and ear candling cleans them out, refreshing them. Everyone can benefit from ear candling, especially children; the reason for this is that children have shorter eustachian tubes which make it easier for them to get ear infections. However, anyone with earaches, infections, labyrinthitis, tinnitus, or other ear problems may very well benefit from the use of ear candles. Ear candles are best put to use if they are done in sessions. One session may not be enough to heal certain ailments, and so having four to seven ear candling sessions is the norm. Ear candling is a service offered here at The Spa at Willow Pond, and it is performed with great care and knowledge of the process. 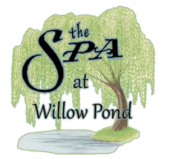 We are excited to have Tina as our newest team member here at The Spa at Willow Pond! Tina is a massage therapist who graduated from the Baltimore School of Massage, as well as the Lancaster Institute for Health Education. Her skills include Swedish massages, deep tissue massages, hot stone therapy, and synchronized massages. Tina is great at what she does, and we are so pleased to have her with us!